As the world's largest ecosystem restoration effort struggles forward in South Florida's Everglades, the Department of the Interior (DOI) will need to make both financial and management improvements to ensure that science can effectively guide the restoration, according to a recent report from the National Research Council (NRC). 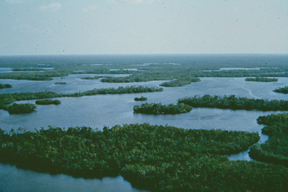 In 1997, DOI established CESI, the Critical Ecosystem Studies Initiative, to provide science for restoring ecosystems on DOI lands in South Florida, particularly in Everglades National Park. CESI focuses on addressing urgent science information gaps and emerging research needs. This month, an NRC panel of scientists released an assessment of CESI, determining that, while CESI has made valuable contributions to the restoration effort, recent budget cuts will hamper the ability of the program to continue to fulfill its objectives. However, the panel also determined that improvements could begin with changes in how CESI is managed. The Ten Thousand Islands in Everglades National Park are a maze of mangrove islands and shallow creeks along the Gulf Coast of Florida. Photo supplied by Everglades National Park. "Congress should increase CESI research funding to meet DOI's restoration science needs, contingent upon several high-priority improvements in CESI management," the report stated. From the late 19th through most of the 20th century, developers used an extensive system of dikes, canals and levees to make the periodically saturated "river of grass" into dry land available for agriculture and human habitation. A rising tide of protests from naturalists led to the dedication of Everglades National Park in 1947. But decades of drainage, agricultural nutrient runoff and increased pressure on water supply sources following rapid urban expansion have complicated water quality issues across southern Florida. In 1992, Congress authorized what has been called a "Restudy" of the Central and South Florida water-management system to determine whether it could be modified to improve South Florida's sustainability. The result of the Restudy was the Comprehensive Everglades Restoration Plan (CERP), which Congress approved in 2000. CERP's objective was to design a water management system for the Everglades that would restore and protect the ecosystem while still controlling floods and supplying water to the region. CESI, in turn, was created to provide scientific support for these objectives  both for the present, by funding scientific research on how ecosystems work and on how the natural system had been altered by development; and for the future, by developing hydrological and ecological models to predict long-term effects of restoration. However, the budget for CESI has dwindled from a high of $12 million in 1998 to only $4 million in 2002. Such budget cuts, the NRC report notes, have necessitated difficult choices and made targeting every high-priority science need impossible. Inadequate funding for science is potentially costly if inadequately researched restoration projects should need to be redesigned, the report says. "It's not a cost-effective way to do a restoration," says Linda Blum of the University of Virginia at Charlottesville and chair of the panel. The NRC report notes that "funding for CESI science has been inconsistent and is now far less than is needed to support DOI's interests in and responsibilities for the restoration." At the same time, it found that the CESI program could be made more effective by reorganizing its management structure, by placing higher emphasis on currently unmet science information needs, and by more broadly disseminating information to other restoration agencies and to the public. "It was our contention that while we felt that CESI was under-funded, what we would like to see is them develop programs in the areas that there are gaps, decide how much money it would take to address those problems, and then go to DOI and Congress and ask for that money; but that any new money coming into the CESI program would need to be dependent upon improving the management," Blum says. Several areas in which the report finds that CESI management requires immediate attention include "the narrow distribution of requests for proposals, an insufficient peer-review process, and limited involvement of expert advisors." Although the report was not intended to review CESI-funded science, it does highlight some critical restoration science needs that have not yet been met in the areas of social science, water-quality modeling and contaminants. 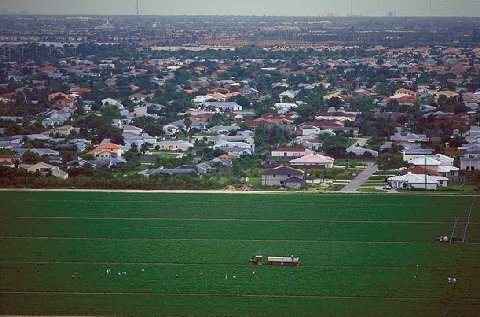 Urban encroachment on the Everglades in Dade County, Florida. Photo from South Florida Water Management District. CESI and other restoration projects need to better synthesize their results, the NRC panel found. "There's very good science going on in support of DOI needs," Blum says. "But among those individual projects the coordination and synthesis aren't as strong as they could be or should be." The concerns the NRC report targets are not unique to any single restoration agency, says Robert Johnson, director of the South Florida Natural Resources Center at Everglades National Park. "There are still issues about the need to integrate better the science programs across the three DOI bureaus in south Florida, and this review was specific to the CESI, which is in the NPS program," he says. "There are similar funding initiatives like this for both the Fish and Wildlife Service and the USGS, and I think the comments on the need for external peer review and the comments on the need for integrating science and research into very clear management positions is universal."